My wife and I have been getting ready for our first child, rearranging EVERYTHING at home – getting rid of a lot of stuff, and setting up a space that works for a family, not just specific tasks. It’s been a fascinating process, one that has me reflecting on the nature of media and it’s role in our lives. Now, I come from a mindset that media – physical media – is beautiful. The idea of a wall lined with books, a stack of records next to the stereo, and a few magazines on the table is a welcome vision. And yet, I find myself disposing of, and packing away my physical media. Magazines I had been saving are now being recycled. My precious record collection is now in storage. Books have been whittled down to the few that I may actually want to reference in the next 12 months. Instead of having physical media around, I find myself embracing digital media in greater ways. My high-end stereo with a turntable that used to take up an entire wall has been replaced by a set of small speakers, and a plug to link my iPhone to it. My phone is now my stereo. Instead of having books and magazines all over the place, I ordered an iPad which arrives this week. I like the idea of leaving it on our living room table, something that is conversational, not isolating. I’m thinking about getting rid of my iMac and replacing it with a notebook computer – something that can be used anywhere at home, and stored on a spare 2 inches on a shelf. Digital takes up less room, that is part of my transition: making room for baby. But it also allows for fewer definitions of space, since their form is so small and mobile. The living room can be transformed for many uses, and media does not overwhelm the space – it simply enables activity. Mostly, my wife and I are defining spaces by the experiences we hope to have there as a family, and I am simply expecting media to be available anytime, anywhere, to be integrated as we need it. And yet, media is a core part of our everyday existence. Music will be playing constantly – new videos and articles will be available at a moment’s notice – the world’s information is always present – and entertainment (be it games or movies or TV) are accessible, but not overwhelming. So many people view the media itself as the goal – perhaps they are writing a ‘book,’ or creating a ‘magazine.’ But the experience is what they should be aiming for. All the massive transitions in the past decade have not lessened media’s value – it has simply become more integrated into the fabric of our lives in subtle ways. A room doesn’t need books to be filled with them. A room doesn’t need a screen on the wall in order to watch a movie. A room doesn’t need a stereo system in order to have music. A room doesn’t require a workstation in order to access the world’s information. 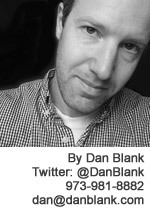 Let me know if I can help you in your media journey: @DanBlank, 973-981-8882 or dan@danblank.com. Previous Previous post: Elders vs Gurus: Why Don’t We Listen to the Voice of Experience? Next Next post: Hustle. The Old-Fashioned Way to Thrive Online.